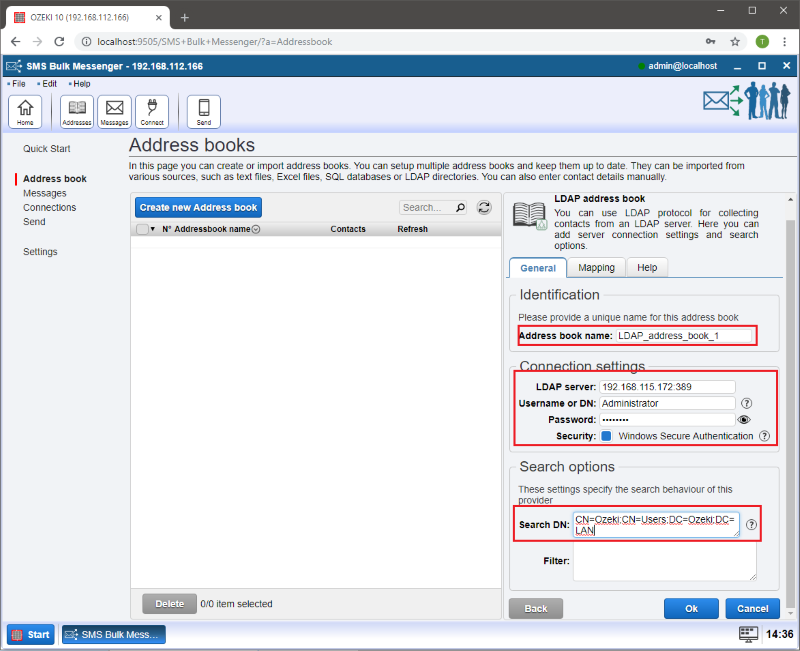 You can use the LDAP protocol with Ozeki Bulk Messenger to import contacts from an LDAP server. 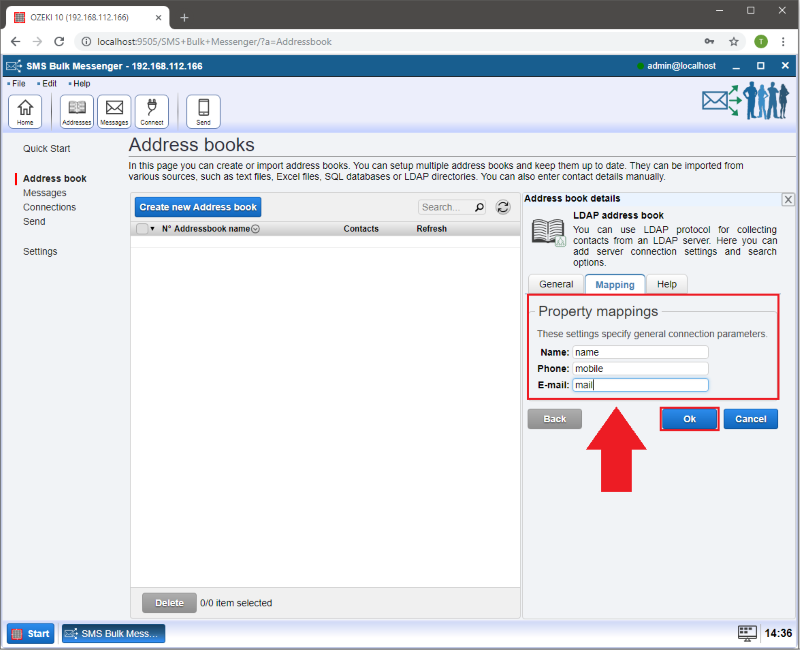 There are endless possibilities for configuring such connection, so in this tutorial we will present how you can properly configure the LDAP connection to import contacts from the LDAP server. First of all please select 'Step 1 - Make an address book' in the 'Fist steps' section found on the 'Quick Start' tab. 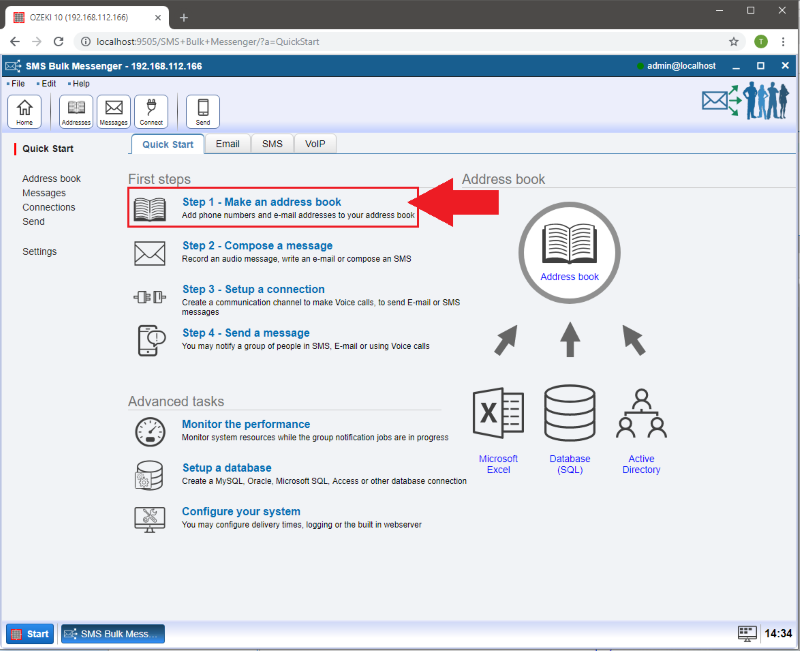 Click on the 'Create new Address book' button. The 'Address book details' window will appear on the right. 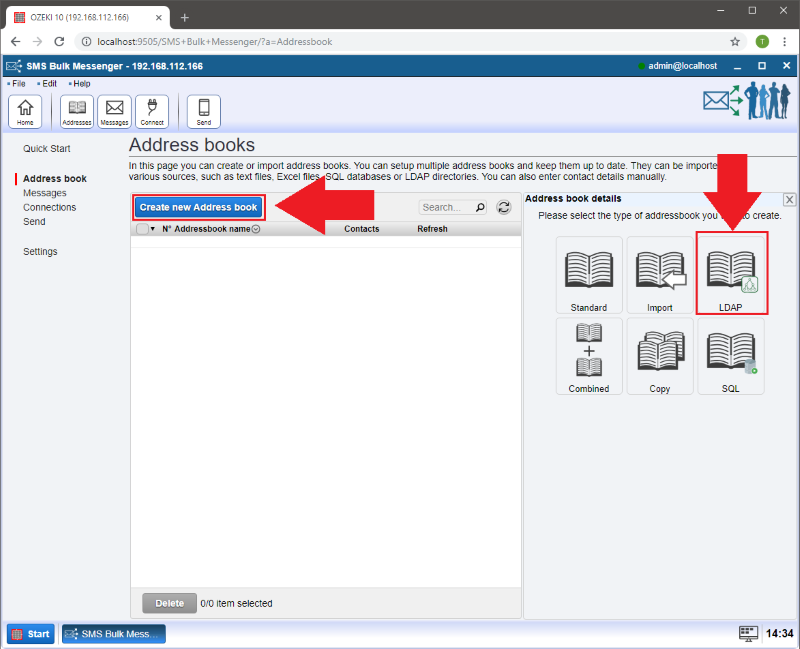 This is where you can select the type of the address book you would like to create. In this case please select 'LDAP'. In the 'Address book name:' field you can give a name for your address book to make identification easier. 'Username or DN:' The search query will be initiated using this user. If not specified, the search will be anonymous. 'Password:' The password belonging to this user. 'Security:' This type of authentication is required when using Active Directory services. 'Search options:' These settings specify the search behaviour of this provider. 'Search DN:' The LDAP addressbook provider will issue the search requests in this DN. E.g. "cn=myaddressbook,dc=test,dc=com" where com is the root node, test is an organization under the root node, and myaddressbook is an organizational unit of test organization. 'Filter:' The LDAP addressbook provider will look for the classes defined here (delimited by colons or semicolons). You can use the LDAP protocol for collecting contacts from an LDAP server. Here you can add server connection settings and search options. Addressbook property (first column: Name, Phone, Email): This is the name of the property used by the addressbook in Ozeki Bulk Messenger. If you use OpenLDAP server, you can find the LDAP Property names in the attribute column of the Ldapadmin application. If you wish to use the Active directory of Windows Server, you can find the attribute names under the attribute editor tab, in the attribute column. Now you have successfully connected your database. Here you can manage your imported contacts and add new ones or refresh the list manually.